While some actors are acclaimed for the body of their work, others earn fame for creating a handful of indelible characters. Harvey Lembeck, like many fine comedians, toiled in minor roles for most of his career in film and television. However, when given a promising role, he seized the opportunity and created three classic characters: Sergeant Harry Shapiro in Billy Wilder's film adaptation of Stalag 17 (1953); Corporal Rocco Barbello in The Phil Silvers Show (1955-59); and klutzy motorocycle gang leader Eric Von Zipper in the Beach Party movies of the 1960s. 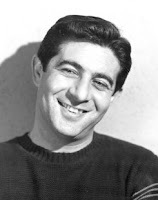 Born in Brooklyn in 1923, Harvey Lembeck first entered show business as one-half of The Dancing Carrolls at a 1939 World's Fair exhibition. His partner, Caroline Dubs, eventually became his wife. After a stint in the armed services during World War II, Lembeck graduated from New York University in 1947, hoping for a career in radio broadcasting. Instead, he wound up on Broadway, playing the character Insignia for three years opposite Henry Fonda in Mister Roberts. (Robert Roark played Lembeck's role in the 1955 film version of Mister Roberts). 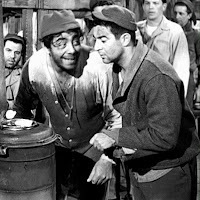 Strauss and Lembeck in Stalag 17. His work in Mister Roberts led to his breakout performance as the wisecracking Sergeant Harry "Sugar Lips" Shapiro in the original stage version of the P.O.W. drama Stalag 17. Along with Robert Strauss as "Animal," Lembeck balanced the play's serious aspects with unexpected humor (e.g., "I'm tellin' ya, Animal, these Nazis just ain't kosher!"). When Billy Wilder adapted Stalag 17 for the big screen in 1953, Lembeck and Strauss both recreated their stage performances--with Strauss earning an Oscar nomination for Best Supporting Actor. Two years later, Harvey Lembeck joined The Phil Silvers Show as Corporal Rocco Barbello, who usually found himself knee-deep in the conniving Sergeant Bilko's schemes (e.g., passing a desk clerk off as Bing Crosby at a military show). It was a more subtle variation of his Sergeant Shapiro character, but Lembeck created a perfect comic foil for the fast-talking Silvers. as Eric Von Zipper in Beach Party. A few years after the demise of The Phil Silvers Show in 1960, Lembeck made his debut as Eric Von Zipper in Beach Party (1963). I doubt if anyone expected Von Zipper to become a series regular. Yet, except for Muscle Beach Party, Lembeck plays the motorcycle gang leader--a parody of Marlon Brando's character in The Wild One (1953)--in six of the seven Beach Party films. Lembeck excels in the physical comedy bits and also gets to shine in a couple of musical numbers (the best being "I Am My Ideal" from Beach Blanket Bingo). But Eric Von Zipper is best remembered for his classic dialogue, perfectly delivered by Lembeck in an exaggerated Brooklyn accent. Two of my favorites: “Eric Von Zipper adores you. And when Eric Von Zipper adores somebody, they stay adored” and "Him, I like...you, I don't like." In 1965, Harvey Lembeck founded The Harvey Lembeck Comedy Workshop to teach aspiring comedians. Lembeck explained: "“You can’t teach an actor to be funny. If the humor is innately there, we will give him the tools and nourish his own abilities to grow.” Over the years, the workshop has been attended by actors such as Robin Williams, John Ritter, and Mary Kay Place. Lembeck's children, director-actor Michael and daughter Helaine, run the workshop today. Harvey Lembeck continued performing on TV series such as The Love Boat and Mork & Mindy right up until his death by a heart attack in 1982 at age 58. He left behind a successful acting school and a legacy of memorable film and television characters. I was so delighted to see your profile on Harvey Lembeck! I am not familiar with his work on "The Phil Silvers Show" but admire his performance on "Stalag 17". I enjoy the Beach Party movies especially because of Eric Von Zipper. What an unforgettable character! Thank you for a most excellent Lembeck tribute! I love Harvey Lembeck. Always have. Always will. I remember him most from the Phil Silvers Show which was always a 'must see' at my house growing up. Never saw him in any of the beach blanket movies because I never saw any of those movies except for GIDGETd which earned me a strange look from my friends because I maintained that Gidget should have wound up with Cliff Robertson. I mean, NO comparison to that little Jimmy Darren - ugh. Obviously I had a thing for older men as a kid. Ha! Really enjoyed your post -- I always liked Harvey Lembeck, and I remember how excited I was, way back in the day, when I started seeing his son, Michael, in acting roles on shows like Mary Hartman. Lembeck and Strauss also worked as a team in "The Last Time I Saw Archie"